Several years ago, our church began wondering how to advance church-based theological education. While the church continued its traditional Sunday school and adult bible study programs, we also perceived that the culture around us was changing. Our members (and potential members!) interacted with sophisticated, on-demand technology every day in their offices and homes. Those in our community listened to podcasts as they commuted and streamed YouTube videos in the evening. How could we better leverage technology in our Christian Education programs? Could we think more creatively about how to deliver our programming to an increasingly busy and technologically-savvy congregation? These wonderings led to the development of “TheoEd Talks.” This program brings together leading thinkers from the academy, the church, and the non-profit sector. Each speaker offers a 20-minute talk designed to spark meaningful conversations on how we think about the Bible, theology, and faithful engagement in the world. These talks will be recorded on audio and video and made available through our website as a free, public resource for download. 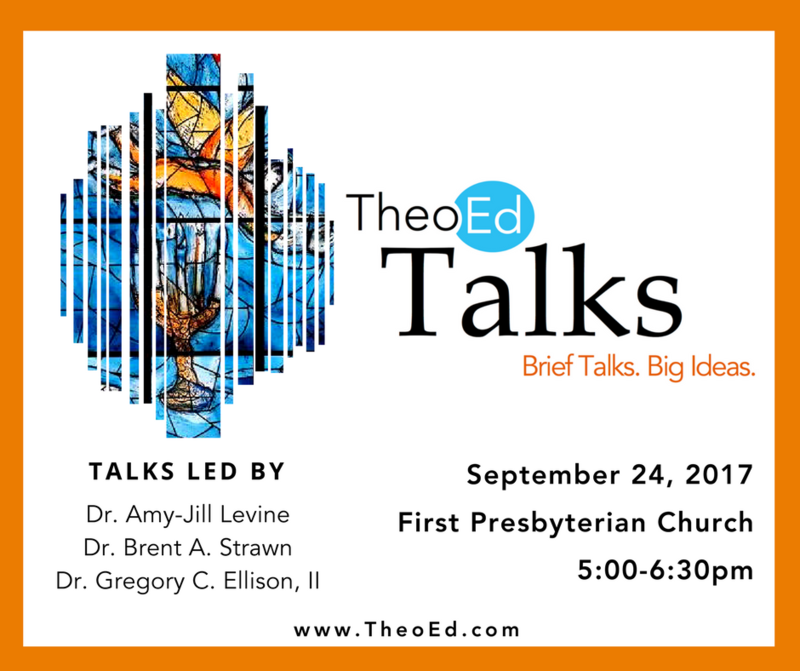 The first series of talks will feature: Dr. Amy-Jill Levine, Professor of New Testament and Jewish Studies at Vanderbilt Divinity School; Dr. Brent Strawn, Professor of Old Testament at Emory University; and Dr. Gregory Ellison, Associate Professor of Pastoral Care and Counseling. The inaugural live recording will be held at First Presbyterian Church on the evening of Sunday September 24, 2017 from 5:00-7:00pm in Fifield Hall. To register or for more information, visit our site at: theoed.com or contact us at: theoed.com@gmail.com. Cassie Waits graduated in May from Columbia Theological Seminary in the Masters of Divinity Program. To read her complete essay on the rationale behind TheoEd Talks, which won the Julia Abdullah Award for innovative educational ministry design, click on the file linked here. Are you looking for intergenerational worship centers that get all ages to think and become active with their faith? Well, I have a source to share that we tried out at Columbia Theological Seminary a week ago that was a success. Earlier this summer I ran across the work of Lilly Lewin at Free Range Worship. 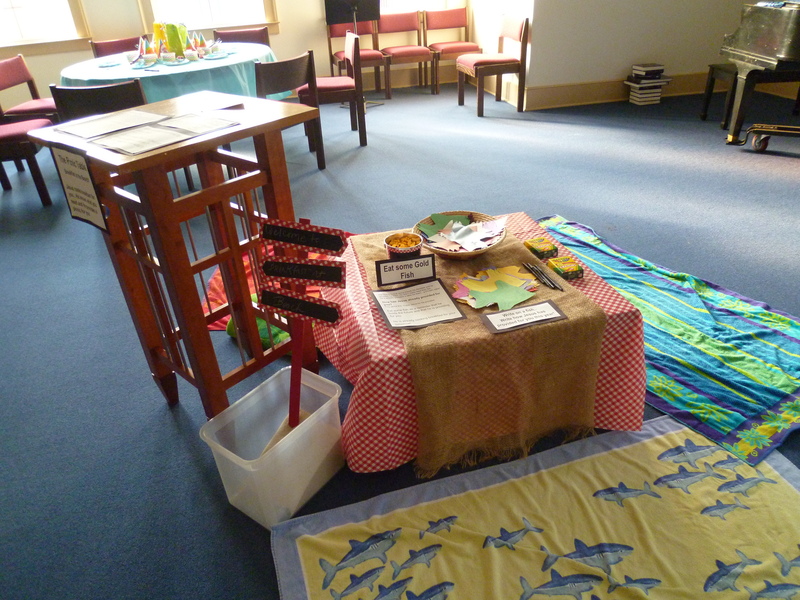 She was the worship leader at the Intergenerate Conference in Nashville and had set up a room under the theme Tables with Jesus, where each table had a different theme from the life of Jesus that engaged the viewer in thoughtful reflection and action. Most of the tables use objects that can be found around the home and all the signs and instructions are available for a reasonable price on her website. Here you can see how some of our tables turned out without all the people who came. We left them up for several days after the chapel for people to explore on their own time. We only did seven stations, mainly because I had seven students in my doctoral seminar and they each were in charge of a station. Party with Levi Table- Focuses on the outcasts of society and thinking who we invite to the party. The activity is to write the names of the unlikely guests on band aids that can be worn as you remember to pray for these individuals or groups. 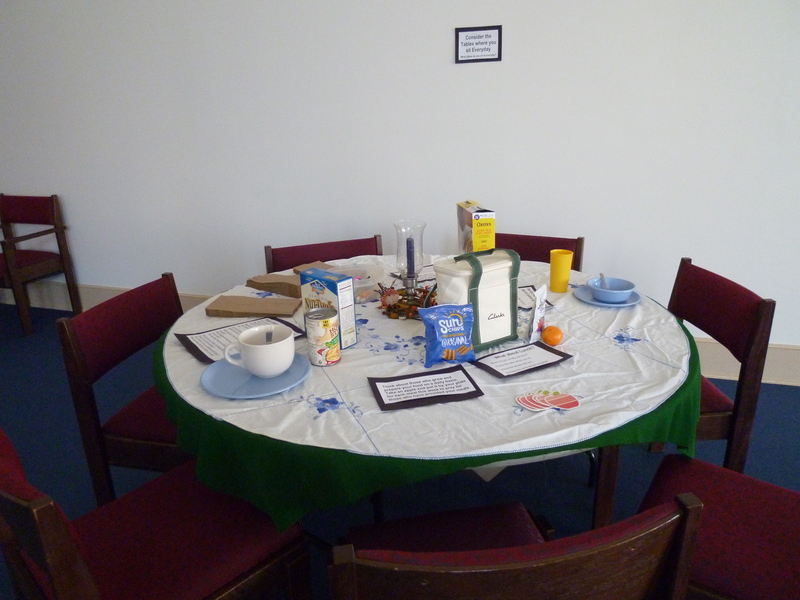 Table of Reconciliation- What does it mean to set a table in the presence of our enemies as it says in Psalm 23? Every Day Table- With whom do we sit down at breakfast, lunch and dinner? Who should we invite to join us? How can we pray for them throughout our day? Lilly Lewin will be writing an upcoming post for us about the many other ideas she has on her site. 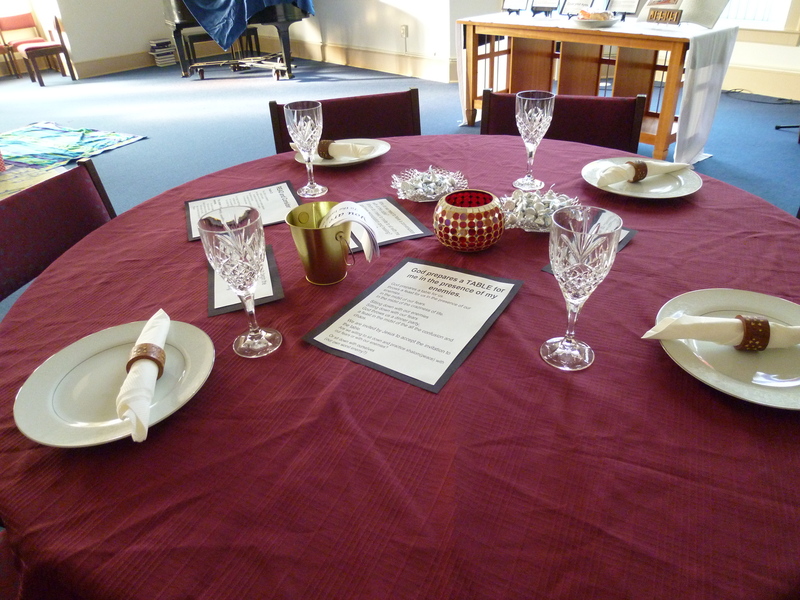 I hope this post provokes you to think about all the tables that constitute our lives and at which Jesus joins us. Sharon Ely Pearson shared the results of her ecumenical curriculum survey on her own blog. I wonder how your ministry matches or challenges these results. 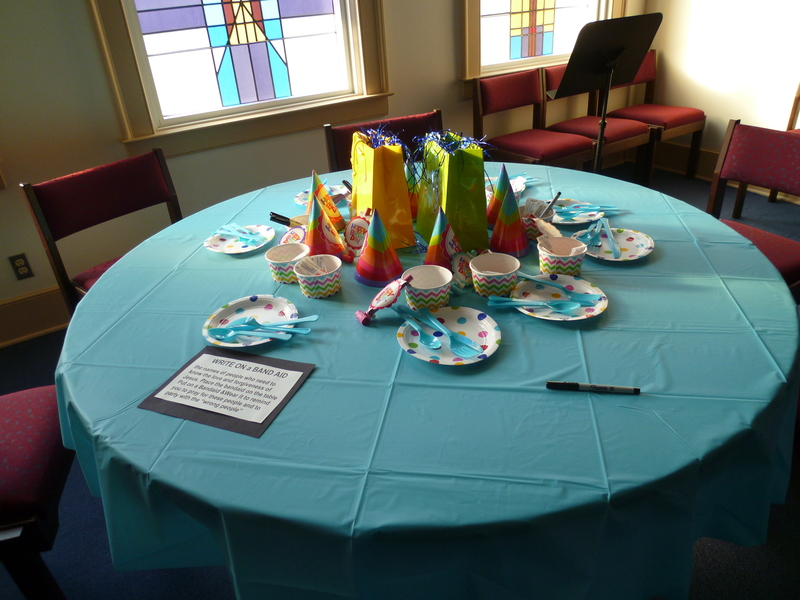 An on-line survey was held on a voluntary based during June 2016 to learn what curricular programs were being used in congregations with children, youth, and adults. The survey was disseminated through e-mail and social media (predominately Facebook groups) and various organizational list-serves (Forma, APCE, CEF,AUCE, and the Christian Education Network of the ELCA). The construction and results of the survey was conducted by the research group of the Church Pension Group, the parent company of Church Publishing Incorporated. The analysis of the data is strictly mine, and I take all responsibility for its interpretation. Over the past couple of years, I’ve had a number of questions from parents and grandparents about where and when to start talking to their young children about faith. Many of them have little or no experience as children themselves or ones that they would not like to repeat. Recently, I began a blog “FaithSprouts”. Designed to provide simple ways to engage small children around stories of faith, the blog includes a short reflection for caregivers, a book suggestion, an activity and a suggested prayer. You can find the most recent blog here . Hopefully these simple stories and practices can support faith in each household. My mother began her teaching career in the public schools in the early 1970s. Over the years, she has recounted the times when she was expected to read the Bible to students. She remembers lovingly sharing Bible stories and even praying with her elementary-aged students. However, as the years passed, those expectations changed, and by the time she retired a few years ago, she no longer read—and wonders if she would have been allowed to read—Bible stories to students. Our story is so common, a 125 year old congregation, inner-city, wants to minister to the community around it, I’m sure you have heard it all before. We have a separate family chapel, attended by substantially more persons than Sunday school hour. Our take away was that families are interested, but not in our traditional model.